Constant economic growth to create new jobs and counteract the reduced need for manpower caused by technological advancement. The third option is generally preferred by policymakers, academics, the public, etc. for the reasons described above, as well as other reasons. Capitalism requires a constantly expanding production and consumption of goods, which can only be achieved through the increased exploitation of the planet’s natural resources at an unsustainable rate. Because of this reality, sustainable development cannot be achieved without a dramatic reduction in the levels of production and consumption, which directly contradicts the growth logic that drives capitalism. So, I am wondering if and how capitalism can deal with this? What if we reach the limits of the environment and economic growth is no longer possible? Why would capitalism have an answer? Your question presumes that economic systems should be fully planned out into perpetuity, but that's just a false premise. You might as well ask what democracy's answer to peak oil is, or what individualism's answer to FTL travel would be. All capitalism means is that people are able to earn money off of things that they own (private ownership of capital goods). It's not like it's something that a cabal of people got together, mapped out, and implemented from the top down. It's emergent behavior that was later described as capitalism. Not all parts of the economy consume finite resources equally. In fact, only a minor portion of it is related to the manufacturing of goods in the industrialized countries. 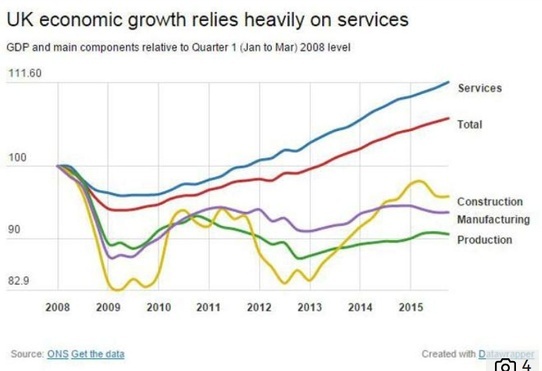 Most of the economy there is services by now and, even more related to your question, most of the growth is growth in services. In fact, there is plenty potential for services to grow even more. For example, if you live in a western country and you get older, you wish there were more service workers tending to elder people available. However, this does not mean that globally the use of resources is stagnating. Many products consumed in the US are made in China and even working in services consumes resources. Resource usage is still very much increasing. Services can be very eco-friendly jobs with a relatively small resource usage per job. Let's think for example doubling the number of teachers in schools which would could likely be done with little additional resource usage. The shift to these jobs could happen quite automatically in capitalism. If resources become scarce they also become very expensive. Also, some resources are renewable: food, energy, recycled materials (to some extent), wood, .... With regard to manufacturing and production there certainly is a desire to use existing resources as efficiently as possible with this kind of optimization still ongoing. Saving the planet mostly probably will mean not using more (rather less) of the resources. This means that on average jobs have to be much, much more resource efficient and that global manufacturing may decline, which would mean that for example people might use things for a longer time or live on smaller space. However, it's much to early to deduce the downfall of capitalism because of that. If I would be worried about capitalism, I would worry about ongoing trends in artificial intelligence and automation. Summary: Capitalism will use all available resources before anything changes. Only if resources become scarce, they will also become expensive. The world economy will then shift to labor that uses low amount of resources. These jobs will mainly be in services and within services only those who use low amounts of resources. The claim that constant economic growth within a planet of finite resources is impossible is false. Natural resources can be physically finite while being economically infinite. That is, regardless of the physical amount of any given resource exists in the world, it is possible to have the entire supply necessary to meet human demand. In "capitalist" societies, this is accomplished through the use of the price system. When a resource is scarce, it becomes more expensive, so people demanding it use less, and people supplying it try to provide more. When a resource is plentiful, it becomes less expensive, which will drive up demand and make it possible for suppliers to profit from the larger volume despite the lower price. There are limitations to the price system; it only works for things that can be owned in a free market economy. It is difficult to own the air or wildlife, which is why these things tend to be overused and used poorly. It also only works if the prices are the result of market supply and demand; if price controls are imposed, then the system breaks because the information about scarcity conveyed through prices is no longer available, so people tend to overconsume whatever the thing is. As an example of this in action, there was a famous wager about the price of metals over a ten year period in the 1980's between economist Julian Simon and biologist Paul Ehrlich. Simon wagered the price of 5 metals would go down in the ten year period, Ehrlich wagered the price of metals would go up because they would be depleted. Simon won the bet when all five metals of Ehrlich's choosing decreased in price after the 10 year period. I would like to (sort-of) challenge one of the premises of the question, namely that resources are finite, and I have a strong and weak version of the challenge. I mean, sure, there's only so much matter in the planet, and only so much of it is useful for our current purposes. Whether you think the end is in decades, centuries, or millenia, anyone who can count more than the sum of their fingers and toes can look ahead to the end of the tunnel. But human ingenuity is also a resource, and human creativity is unbounded. Think about it. Finance? Law? Software? These things are huge sectors of modern economies and they consume far fewer resources than hard industry. Trilarion's upvoted answer focuses a lot on the service sector, another great example. How much of our resources today exist in the form of intellectual property? I'm leaving the following paragraph in but see gerrit's comments below for a more sobering take. I'm not sure it reverses my conclusions but it does arguably weaken my case. Not sure how the theory plays out, but in practice we've already begun to pivot in this direction more and more. N.B. that's exactly what capitalism says should happen: as physical resources become scarcer their value increases and we either have to live with shortages... or pivot to something cheaper. Which coexists with the version above: we'll never run out of resources before something else happens. That something else might be the extinction of the human race, space travel/colonization, digitization of consciousness, whatever. Why aren't we doing more in those spheres now (at least the more positive ones)? Because it isn't economically viable. But again, as physical resources become scarcer their value will increase, until it becomes more viable to strip mine asteroids than continue to deplete the Earth. There are some holes in the strong version: if agents are allowed to proceed to maximize their utility without regard to negative externalities generated (e.g. a factory can pollute with no consequence) then the incentives are warped. If the ecosystem that sustains life here is wrecked by e.g. AGW then game over. You can probably think of others, but the point is that continuing current trends forward unboundedly is likely selling humankind short. I think you might have gotten the wrong impression from the answer you linked to. When technology, production of capital equipment, or education make workers more productive, it frees up human resources that can be used elsewhere. If those people were not able to find work and were simply "automated out of a job" then that would be bad. Fortunately, this person can then take on a new job. This is where the growth happens. Imagine a world with just a finite supply of farmland which is all used by people engaging in subsistence farming. All the resources of the world go into farming and people eat all the products of that farming. Suddenly one of the farmers develops a new plow that lets 5 farmers do the work of 6 farmers. Now 1 in 6 farmers no longer have to farm. These farmers can now become entertainers who put on plays and tell stories instead of farming. All the resources of the world are still being used, but now people get this new thing that makes them happy, entertainment. This is economic growth. It didn't require any more resources from the world, it just required increased technology that freed up labor for new things. Hawken and the Lovins’ agree with Kovel that the current model of capitalism is problematic. “Capitalism, as practiced, is a financially profitable, non-sustainable aberration in human development.” But they do not see the problem as residing in capitalism itself. They distinguish among four kinds of capital, all necessary for production: human capital, financial capital, manufactured capital and natural capital. The problem with the current form of capitalism, they argue, is its radical mispricing of these factors. 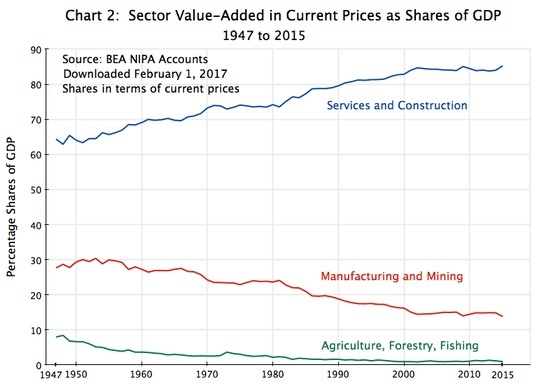 Current market prices woefully undervalue—and often do not value at all—the fourth factor: the natural resources and ecological systems “that make life possible and worth living on this planet." Hawken and the Lovins’ argue that these remedies—properly applied—can work. The first step, they say, is to eliminate the perverse incentives now in place. They document the massive subsidies that governments currently provide for ecologically destructive behavior, e.g. highway construction and repair, which encourages suburban sprawl and the shift away from more efficient modes of transportation, agricultural subsidies that encourage soil degradation and wasteful use of water, as well as subsidies to mining, oil, fishing and forest industries. Second step: impose resource and pollution taxes so as to reflect the true costs of “natural capital.” Sweeten the pie by phasing out all taxes on labor (which increase unemployment), and income taxes as well. The point is to level the playing field so that more sustainable energy technologies and more energy efficient processes can compete fairly with the destructive practices of “industrial capitalism". We might even want to go further, and subsidize—at least initially—the technologies that reduce the negative environmental impact of our production and consumption choices. Of course, critiques of this approach abound. The paper discusses some. See also linked wikipedia article, for a summary, and this article for a comparison of green capitalism and green socialism. Capitalism is all about profit. And everybody is interested in highest possible return on investment (true for every capitalist starting with unskilled worker and on J.Bezos ending), so maximizing profit is the best strategy for achieving that goal. Obviously, it can be done in multiple ways, of which reducing the costs is always first and foremost. That includes reducing labor force of an enterprise, which is but one and least efficient, albeit most vilified method. Most often though capitalism employs new technologies, new materials and new ideas to increase productivity and/or reduce costs. And it can be seen across world and time, that production of anything becomes more efficient, streamlined, less wasteful etc. There is no reason to assume that the need for natural resources will be constantly increasing ad infinitum without allowing for the possibility of either substitution (humans may develop a technology of converting old plastic bags into new synthetic material stronger than steel, for example) or there will be new sources of resources (i.e. asteroid mining). In the meantime capitalism's answer is improvement. Not sure how old are you, but I remember when instead of a smartphone one required a huge desktop computer, printer and phone for effective office work. Think on how much technological progress reduced the need for resources going from fifty kilos of various materials to less than 200 grams (which is 250 TIMES) without reduction in productivity (in fact, it increased it dramatically). Is it really hard to apply same logic to almost EVERYTHING (to various extent, of course)? tl;dr: Material resources do not disappear, they just become harder to reuse. This is solvable with energy of which there is an effectively infinite resource. This is less about "capitalism's answer" because capitalism has zero answers to anything; it is just a self-organizing economy based on the acceptance of private property and otherwise free individuals.1 As it turns out, the majority of people, at least with the prevailing memes, seem to want ever more stuff and power if not for themselves then for their children, which drives economic growth. Physical resources come in two flavors: Those which can become depleted (e.g. ores, fossil fuels) and those which can become unusuable, e.g. by contamination or climate change (air, soil, water). Nothing really disappears — it is just dispersed. The passage of material through the economy is conceptually a concentration of distributed resources (like ores or atmospheric CO2) into products (like cars and agricultural products) during production; and then the reversal by spreading them out again during and after consumption (car wrecks rusting away, feces washed into the oceans and CO2 exhaled into the air). The same is true for substances which contaminate the environment like chemicals used in manufacturing or toxic materials in products like batteries or plastics. The first step, concentration, needs energy. The more distributed the raw material is, the more energy is needed to concentrate it (example: Uranium ores vs. crude oil). Distribution is a form of increasing entropy; concentration is a form of lowering entropy. Increasing entropy is easy because energy flows from high-entropy to low-entropy places, passing through any process you put in the middle (e.g. a human, a car engine). This energy flow can be used to locally decrease the entropy. We humans are examples of low-entropy islands. As soon as we stop breathing or eating we die and entropy takes its course. All manufacturing decrases entropy locally by concentrating and organizing distributed and un-organized substances (ores to cars). To do that the industry establishes an energy flow; some of the low entropy in oil or, recently, solar rays is "diverted" into islands of low-entropy products. Not surprisingly the highest-concentrated raw materials are the most sought-after ones. The same principle used in production — separate usable raw materials from unusable substances — can be used to de-contaminate resources like air, water and soil. It's just that the process needs to reverse a lot of entropy gain because contaminants are often widely and evenly distributed, and hence needs a lot of energy. But this retrieval of distributed raw materials and contaminants is entirely doable; it is just a question of available energy. Here comes the good news. While planet earth is a closed system for material, it is eminently open for energy, which flows through the planet at a staggering rate. Low-entropy solar radiation (see this question) is absorbed, passes through the system earth and is radiated away as high-entropy infrared radiation. This abundant flow of energy can be diverted by the economy and put to good use. Enough of it is available to satisfy any global demand in the foreseeable future. Solar cells will continue to drop in price (they are just semiconductors, after all) and will switch to more abundant and less toxic compounds. They'll produce enough energy to clean up after themselves and then after the economy proper. Together with technological and social innovation (car sharing, public transportation, less meat consumption etc.) the global economy can be sustained at high levels of material throughput, which will be a near-complete cycle. 1 Of course this kind of capitalism does not exist (and has never existed) anywhere; it is always embedded in a political framework which is precisely tasked with giving those answers which transcend the economic realm as well as controlling, directing and dampening the effects of the economic realm on individuals and the collective. But discussing the political answers to an economic drive for constant growth would be a different thread altogether. 2 Think Kardashev Scale and Dyson Spheres. Economics is simply the use and management of time and energy. That is all humans actually "have". Whether a label of capitalism or communism or any other ism is attached to use of time and energy or not. There is no central capitalism committee. There are different answers for different individuals and institutions. Some exploit resources until there are none remaining. Whether capitalism or communism is the system used to exploit resource until there are no more is irrelevant. Before proceeding it is important to note the fact that humans have in fact impacted fish, wildlife and water resources due to their activities. Unsustainability is not a mythology. Natural resources do decline based on human activities and can be depleted to the point of no return without human recognition of those facts and the altering of human behaviour and conduct as relates to their usage of the natural resource. Depletion of natural resources is not exclusive to capitalist systems. The steep decline in Chinook salmon is associated with three main factors: - Habitat change. - Harvest rates. - Hatchery influence. Some alter their approach to generating profit based on a wide range of reasons. Individually, once aware of unsustainable trends, the person can alter their own behaviour to as not to be a contributing factor to unsustainable practices. Conversely, if an individually has reached the conclusion that there is no such thing as unsustainable trends, they can, too, invest in scarcity, or the current or projected trends for profit. Would be cautious in attributing unsustainable practices solely to capitalism. China is not, generally, considered a capitalist nation. However, the Chinese people and the Chinese Government are not fools. China is a major purchaser of U.S. debt instruments. China is involved in major construction projects in Africa and Asia. Neither of those facts are particularly motivated by capitalism alone, the motivations are strategic as well. If profit can be made within the scope of long-term strategic goals and activities, China and the Chinese people will not forgo said profit. So, I am wondering if how capitalism can deal with this? What if we reach the limits of the environment and economic growth is no longer possible? "Who ordered chicken? Chicken is what poor people eat"
The above is an actual quote by a primary guest on a luxury yacht when the chef served them and their guests chicken for a scheduled meal. This lead to this user fact checking that statement. We’re producing a lot of chicken meat: about 110 million tonnes per year. And we’re producing more and more. In 1966, global production was 10 million tonnes. In just twelve years, by 1978, we’d managed to double production. Fourteen years after that, 1992, we managed to double it again, to 40 million tonnes. We doubled it again to 80 million tonnes by 2008. 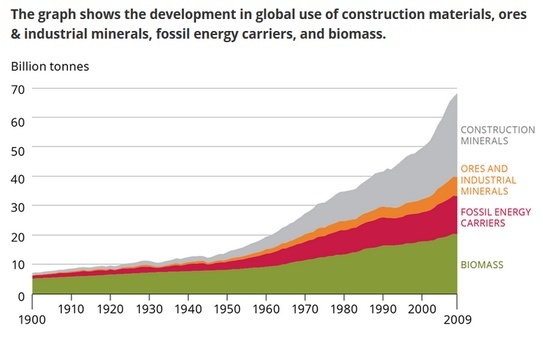 And we’re on track for another doubling—a projected 160 million tonnes per year before 2040. 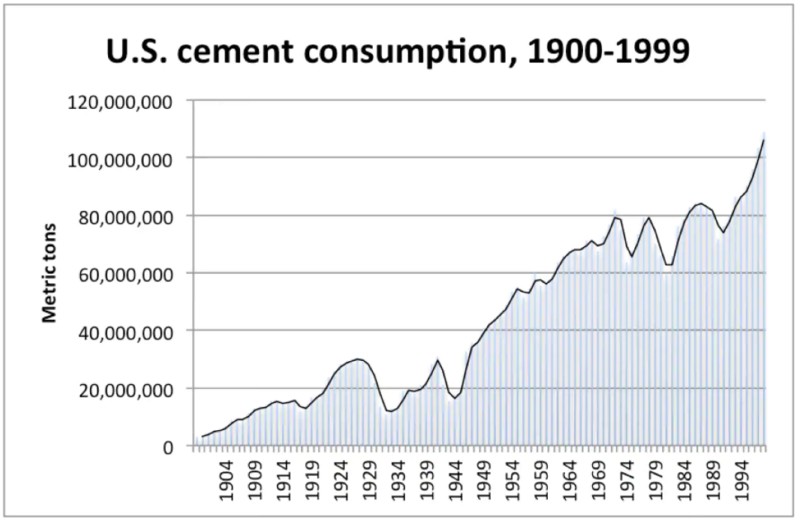 By mid-century, production should exceed 200 million tonnes — 20 times the levels in the mid-’60s. The U.N. has urged people to transition to a meat and dairy-free diet, given the projected requirement to feed 9 billion people in 2050, see 2050: A third more mouths to feed. Wilkinson said that Cobb has projected that by 2050 a 2 kilogram (4.4 pound) broiler would be marketed at 19 days post-hatch with a feed conversion ratio below 1.0. In 2050, a laying hen may produce 550 eggs by 100 weeks of age and have a feed conversion ration approaching 1.0. The poultry industry has doubled production every 12 years since the 1970's. The poultry industry projects that poultry production will double again by 2050, which is a key year for for a vast range of economic and social forecasts. However, even given the efficiency of the poultry industry, there are still concerns that economic growth relevant to poultry production is unsustainable. The reasons cited are the several, including the necessity to produce grain to feed 50-day chickens, fresh water and land. However, poultry represent a threat to human health, especially as a vector of infectious diseases and because of its role in antimicrobial resistance. Furthermore, poultry has a significant impact on the environment and is a large consumer of natural resources. While the sector is usually seen as efficient in converting natural resources into edible products, it uses large amounts of land, water and nutrients for the production of feed materials and contributes to climate change, mainly through feed production, and air and water pollution. In general terms, throughout the twelve months to mid-2017, we observed a significant increase in wealth across the globe, driven not only by equity markets, but also by significant increasess in financial wealth. In total, golabl wealth has grown by USD 16.7 trillion to USD 280 trillion, which corresponds to a rise of 6.4%. We further saw an increase of 2.3 million US-dollar-millionaires, almost half of whom reside in the United States. The large base of low wealth holders supports higher tiers occupied by progressively fewer adults. We estimate that 3.5 billion individuals – 70% of all adults in the world – have wealth below USD 10,000 in 2017. A further 1.1 billion adults (21% of the global total) fall in the USD 10,000–100,000 range. While average wealth is modest in the base and middle tiers of the pyramid, the total wealth of these segments amounts to USD 40 trillion, underlining the economic importance of this often overlooked group. The base of the pyramid The layers of the wealth pyramid are quite distinctive. The base tier has the most even distribution across regions and countries (Figure 2), but also the widest spread of personal circumstances. In developed Figure 3 Number of dollar millionaires (% of world total) by country, 2017 Source: James Davies, Rodrigo Lluberas and Anthony Shorrocks, Credit Suisse Global Wealth Databook 2017 Figure 2 Regional membership of global wealth strata Source: James Davies, Rodrigo Lluberas and Anthony Shorrocks, Credit Suisse Global Wealth Databook 2017 countries, about 30% of adults fall within this category, and for the majority of these individuals, membership is either transient – due to business losses or unemployment, for example – or a lifecycle phase associated with youth or old age. In contrast, more than 90% of the adult population in India and Africa falls within this range. In some low-income countries in Africa, the percentage of the population in this wealth group is close to 100%. For many residents of low-income countries, life membership of the base tier is the norm rather than the exception. The data is available. In 2019 an individual cannot blame either capitalism or communism nor any other ism for their decisions. Natural resources will last until they are gone. Simple choices, such as actually looking into your food chain, that is the food that you actually consume, is what you can do. If you find that you are contributing to the depletion of natural resources where individuals or institutions have publicly advised the entire world that such practices are unsustainable, it is your responsibility to change your own behaviour to decrease your own impact on decline and depletion of natural resources. Conversely, if an individual reaches the conclusion that natural resources are infinite, or that they simply do not care about or doubt reports stating certain human behaviour and activities are "unsustainable", they can invest in industries where growth is projected, ignoring reports which state that the industry practices are unsustainable. Scarcity generally increases the value of a commodity or product. There is profit to be made, right now, be damned with "unsustainability". Humans possess free will. Humans are responsible for their own actions, not systems; especially where humans are aware of, or should be aware of the impact of their activities. Whether the individual decides to pursue profit or is concerned about the sustainability of profit making, or both, is an individual choice. Pure, unhindered capitalism, does deplete resources. Moreover, it creates huge monopolies and cartels, that become so powerful that they start to resemble governments. Suddenly, a single company starts to control so much land, so many people, and so many resources that they almost look like a nation. Most proponents of capitalism, therefore, agree that some regulation is needed, as "pure" capitalism may not even be possible. Right now, manufacturing is huge in Asia, and services are growing in the West. As resources get increasingly scarce, we do not need to manufacture so much stuff. Growth can be in the services sector, and those services do not need to rely as heavily on stuff that they do today. I showed him this simplified version of his explanation, and he said it was correct. Also, there's hardly any limit to how far this can go. We now have machines doing an immense amount of work that used to be done by humans. Wood may be replaced by synthetic materials. Synthetic materials may be recycled. Oil may be replaced by renewable energy sources, batteries (technology improves all the time), hydrogen fuel cells, fusion reactors (hey, maybe one day). Plastic can be created without oil. We may run out of some commodities, but then new technologies may arrive that mean we no longer need those commodities, or we are able to produce them synthetically. Does the free market make this happen? I will argue in this answer that, to some extent, yes, it, does. However, I will also argue that moderate government regulation is typically needed to prevent environmental devastation and unfair depletion of key resources. Is such regulation capitalism? I believe so. The vast majority of capitalist thinkers have supported some degree of regulation. For example, a massive river does not belong to any one entity, so if the government uses regulation to prevent companies from spilling toxic chemicals into it or extracting too much water from it, I would argue that this is not opposed to the fundamentals of capitalism. There is always some government intervention in capitalism. Usually that means that while the free market is the backbone of economic policy, the government has some ability to regulate the private sector in order to avoid such issues as described in OP. For example, if companies in search of profits are destroying vast areas of forest, which is detrimental to society at large for a number of reasons, then ideally the government should introduce a system (using either permits or taxes to limit said activity to a sustainable level). Most would agree that this is still capitalism, albeit with some modification. Whether this actually happens in practice would depend on the quality of the government in said area, its level of corruption, its competence, democratic dynamics, willingness of the populace to demand certain actions from the government, etc. Success varies based on those factors. So, let us say that everything worked perfectly and industries stopped destroying forests to the unsustainable degree they did before. Does this mean economic growth can no longer happen? Not necessarily. Perhaps one of the things society extracted from the forest was timber, which was used to build houses, furniture, boats, etc. Industries can replace that with renewable materials such as recycled synthetic materials, wood grown on plantations (to a sustainable extent), etc. Sure, this may be more costly (isolatedly) than just straight-up cutting down forests, but there can still be economic growth. Again, this assumes that the government is competent and does a proper job at regulation, that corruption does not get in the way, etc. Also, the free market is not only contributing to the depletion of resources here. It can also contribute to investment in new technologies. If regulation as described above is applied, the free market can also help towards intelligent use of resources. For example, let us say that the oil on Earth is near depletion and will soon be completely empty. (I am not sure how far we are from that right now, it is only an example) Businesses that are heavily invested in oil for their operations will decrease constantly in value in pace with declining oil reserves. Investors will realize that companies that depend on oil are thus worth less, and try to move their funds elsewhere. They may not do that for any environmental reasons or anything like that, but rather from a recognition that there may not be sufficient oil left, as a calculated, reasonable move. If a resource does not exist at all, it can not be used. Competent investors will therefore invest their funds elsewhere, in companies that have based themselves on technologies, infrastructure and commodities that are not about to run out anytime soon. In this regard, capitalism naturally moves towards sustainable development, in some ways. Obviously, one still needs government regulation to prevent environmental devastation. Some olive trees only produce optimal yields up to 80 years after planting, yet investors still invest in them. For the long wait-time, they will demand a return down the line that compensates for the 80 years waited. That, however, will simply increase the cost of olives. As long as investors believe people will still buy olives 80 years from now, the trees will still be planted. If an investor wants a profit after 20 years instead of 80, that investor can simply sell the trees (or the stock in the olive company) after 20 years, which has still increased in value since the olives are now closer than they were at planting time. What I have described in this post is basically what governments around the world have been trying to do for years, with various degrees of earnestness, sincerity and success. Personally, I have to say that some of the shortcomings are very disappointing. What is capitalism's answer to that? I would say, skillful regulation, as described in this post. Some people may say such regulation is the very opposite of capitalism. In a way, that is true. However, all capitalism I have seen practiced and described does involve some (to a greater or lesser degree) such regulation. Therefore, I would say that some regulation is a part of modern capitalism, and it is therefore the answer here. Ideally, the government can use the market as a tool for its regulation, by using economic policy to encourage certain activity while discouraging other. The point of a free market, which is how pricing is determined under capitalism, is that it reacts efficiently to supply and demand. If something drops in supply it will be harder to get ahold of, and vice versa. Accordingly, when an issue is greatly threatening, such as the issue of feeding an explosively growing population in the mid-20th century, capital will be allocated towards the problem relatively proportional to its severity until a solution is found - in this case the Green Revolution. This is not to say that business and private allocation of capital is the solution to everything in this regard - when the costs are so widely spread that no one person or group is incentivized to fix it (the Tragedy of the Commons) it may become necessary for a larger regulatory body to be established. This is not, in a sense, a purely capitalist response, but it is a real-world response by self-proclaimed capitalist countries (Montreal Protocol). So to answer your question, capitalism's answer to constant economic growth and finite resources is that we'll cross that bridge when we get there. When the oil wells begin to run dry, renewables will become more economic as fuel becomes more expensive. When the ratio of space needed for production to protein provided of beef no longer feeds a population properly, another source such as bugs will become more prevalent. Climate change is an example of a more intractable problem that will require more forethought, but there is growing concern worldwide on the topic and as the costs become better defined, it can be assumed that more initiatives will be taken on the topic. Of course, freedom of information is essential to a free market, so this breaks down some when companies withhold information for selfish reasons (e.g. tobacco industry manipulation of research and to take it to a state level the US, Russia, Saudi block of the COP24 climate report) but historically the truth has prevailed. In such cases it is our duty as citizens to press for transparency and accountability. Our current practices are not sustainable, so we'll just have to change our practices as they become untenable on an individual basis. Capitalism is not a way of natural resources handling so much as a way of human resources handling. We motivate people by paying them instead of forcing them under some threat of violence or imprisonment or the glory of God or the common good or return to glorified past or towards an Utopian future or some holy ruler or priest council. The handling of the natural resources is orthogonal to whether the system is capitalist or communist or religious fundamentalist or absolute monarchy or whatever it could be. All these have different ways of handling and motivating people, not of handling natural resources. So, I am wondering if how capitalism can deal with this? The way it deals with everything, by definition: as supply decreases, prices increase, until they are out of the price range of consumers, so demand decreases as well. Meanwhile, if the item was essential, the purely economic pressure to discover or develop alternatives increases until those take over the job (simply because they become economically feasible). Note that this is a neutral process; i.e., this is just the way stuff works, not necessarily a catastrophe for everybody involved, and tells you nothing about the speed of change. What if we reach the limits of the environment and economic growth is no longer possible? It depends on who you're talking to. On the one end of the scale, you have politicians who insist that everything is just fine (insert a "Jedi hand gesture" here). On the other end, you have someone like Michael Rupport, whose movie "Collapse" you can watch on YouTube, and who is very certain that the world as we know it will meet a swift and ugly end, and soon. But one thing is certain: nobody knows for sure. E.g., Ruppert's pamphlet is hinging on a catastrophic Peak Oil event, where everything breaks down suddenly, and a systematic failure of the whole society/economy is inevitable. But he cannot know for sure. It is one scenario amongst many. It depends on your own opinions and character whether you want to use outliers ("everything is fine and will be forever" or "the end is near"), or if you want to accept that we just cannot see the future. It depends not only on how fast the ressource in question disappears, but also on scientific advances; on social changes in behaviour (i.e., the movements emphasizing local sourcing of food, energy, and so on); on the foresight and conservativeness of countries (i.e., whether they make the basic services like water supply dependant on certain technologies, or stick with old technologies); and certainly a lot on randomness (e.g., which kind of political power is at the helm at some deciding moment in time). Competition between individuals lies at the core of capitalism. One businessman invents a better product and a second businessman runs out of business. As resources run out you will see similar competition intensify between different nations. Which inevitably leads to war, the ultimate method of settling a dispute. If we reach a point where the planet's most critical resources are running out with no feasible technological solution in sight, things will end up in armed conflict over the limited assets. There are already numerous conflicts around the world over who gets to control a given oil field or mineral supply, such as the dispute between Sudan and South Sudan over Abyei. We can expect more such conflicts in the future, as we're approaching peak oil and running out of precious materials like helium. If there's only enough goods to supply a billion people on this Earth, either 6.53 billion will have to leave for another planet or the strongest billion people will subjugate the rest. We of course hope that this will never happen (see the other answers for a more optimistic prediction), but war is inevitable if the optimistic predictions fail to come true. I question the premise: the linked article does not appear to support its assertion that capitalism “requires” constant growth. (And even if it did, the private sector's craving for something to happen does not, on its own, mean it will happen.) Why couldn't commerce sustain itself in a steady state? I have seen somewhere an argument that the problem is fractional reserve banking. In simple terms (because I'm not sure I understand it myself), money is created by lending, and repayment of these loans with interest requires even more money to come from somewhere, presumably more lending. This cycle is inflationary if the economy does not grow in proportion to the money supply. To postpone a hyperinflation crisis, the political system manipulates the economy to grow, grow, grow. Global capitalism suffers from serious coordination problems. The capitalist class competes among themselves, not the least because nations compete among themselves. Their greed blinds them. They cannot think in the very long term. The rest of society is also competing among themselves, and are too many (and some might say too ignorant) to coordinate themselves. So a rational response is not possible. Catastrophe has been a common answer for society and nature to force us to change. For instance, when inequality gets too high, wars and revolt happen. So, when we have messed up the environment so much, nature will react, like it's doing it right now with climate change, forcing death, malnutrition, wars and so the population falls again. Malthus suggested this long ago. More recently Walter Scheidel suggested this in his book The Great Leveler. So it's not good news, unfortunately. For one thing, look at people's spending and consumption patterns. we are spending more and more money on things that do not necessarily have a big physical footprint: software, movies, music, telecommunication services and health. Food too, but expensive food is pretty much the same as cheap food in terms of environmental impact (plant vs animal calories aside). You'll also see, that lost in the political tug of war about taking global warming seriously and things like ongoing coal subsidies, a lot of large corporations are in fact advocating carbon pricing. Because, precisely, a lot of companies realize that their continued economic well-being depends on managing the transition to a more careful management of at least CO2 impacts. In short, as far as discretionary spending goes, a lot of where people choose to spend money on isn't necessarily a heavy hit on the environment. And capitalism is all about listening to where people want to spend money on. One glaring exception is transportation, and especially air travel. But fixing that could be achieved by carbon pricing, rather than throwing out capitalism. Not to mention that alternative economic models (for non-subsistence level systems), such as Communism, have generally not been very kind on the environment either. Neither have systems where resources at risk aren't clearly either owned by someone, or managed by some government/institution. For example you can look at international overfishing: its main problem isn't capitalism, it's that there are "free calories" out there for the taking and no one is pricing or controlling stock degradation. If we value the environment, we need to price it accordingly and capitalism has built-in mechanisms to react to those signals. That requires political will and it's unlikely to happen soon, but that's more a problem with the political system (including corporate lobbying) than using a free market per se. And, yes, it is also a problem because voters don't care enough (yet) to vote for environmental policies that will cost them economically. Carbon pricing would drive some companies out of business, sure (and that's a good thing in the long run). But other companies would get created to deliver new goods and services that have less environmental impact. Or to deliver mitigation services. Ask yourself this: if US coal miners were employed, not by US corporations, but by some form of state-owned company, like in the USSR, do you think that winding down the coal industry would be easy if those miners had any political agency in how to lead their lives? Capitalism's answer is a global crisis, which weakens world economic powers and redistributes resource consumption. Such a crisis may be either peaceful (like the Great Depression in the US) or non-peaceful (like WWI, for example - when growing economic powers - the German bloc - tried to overpower existing economic powers - the Western world mainly). So, in fact, there is no such problem in capitalism - its decision is stored inside. About "growth in services economics, which is unlimited". Let's consider, why it is naive. The process itself is described very well in @Trilarion's answer. The answer describes so-called "post-industrial" economics. At first, should notice, that graphics (services percent) are true, but for very special countries from western world, which have such huge services sector (US and UK are most known). You may look at the second graph. We now, that main part of UK GDP is formed by banking sector and services. From the first view, it sounds good - it is a pure service sector, we are just servicing our and foreign banks money, giving credits, so on. But - of course, there is a 'but' - the financial sector cannot live in a vacuum. When it grows too much over REAL sector, we obtain a financial bubble. It may be a big amount of credits, an exchange bubble, or something else, but what we have? We have an economic sector which growth, in fact, is a fake. A bright example: Brexit. You may, again, look at the second graph from @Trilarion's answer. The UK have a huge financial sector (result of M. Thatcher politics of 'de-industrializing'). What Brexit means? It means (and Deutsche Bank already have done it), that EU banks will stop to use UK bank services, because of UK is exiting, and retrieve their finances from UK back to homeland. How do you think, this will affect UK bank sector (and, as it is huge, huge part of economics)? It will collapse. You may say - but what's the difference between EU and UK, if both have a financial sector and banks? Yes, both have, but EU do have a big REAL sector (which can be an investment target to the banks, and supports it) and UK does not. To conclude. That theory - about constant growth, provided with services constant growth - is applicable in a one-hegemony-world, which is globalised. While hegemonic growth its services, which is consumed by others, others, in return, provide something REAL. A bright example is the 'late-Washington' world - before Russian comeback to global powers. But now, as the world becomes multi-polar again, this is not more than a pure theory. Mahatma Gandhi once said "The world has enough for everyone's need, but not enough for everyone's greed.". I think that statement sums up how the ideology of capitalism needs to be ethically framed in order to save the biosphere and stop theft of resources from future generations. "Enough" has to be defined, a "greed exit strategy", so to speak, that would strike the right balance between acceptable Return On Investment (ROI) and the needs of society, the biosphere, and future generations. Right now there is no definition of "enough" other than infinite greed. Also, in order for capitalism to work ethically, property rights and how they are defined must be worked out. If you think about it, there is really no such thing as property "rights". There are property "claims" which society would honor or dishonor based upon the merits of the claim. Private "ownership" of property is very well documented. Whereas the common property that naturally belongs to everybody is seldom documented as proportioned to each citizen's account. Just as not having a birth certificate does not mean someone does not exist, similarly, just because a citizen's equity share in the commons is not documented does not mean the citizen does not have claim to said portion of the commons. Capitalism, as far as I know, does not mention how property claims are vetted and distributed justly through society. It focuses on the free market mechanism where supply and demand determine price and true competition prevents monopolies. If the free market mechanism is fully allowed to work, and property claims were equitably distributed in the society, a wealth gap should not be able to develop. In capitalism, there is no "too big to fail" or governments (that belong to everyone) enforcing dubious property claims of a few. Finite doesn't mean constant. There may be limited resources, but that doesn't mean we cannot find or produce more resources. It also doesn't mean that we can't find better ways of allocating resources, or of extracting the greatest productive value from these resources. An improvement in these is what leads to economic growth. The fact that resources are scarce is the whole point of capitalism, and really of economics -- more precisely, the question that any economic system answers is "given that resources are finite, how do we allocate them most efficiently with the goal of creating greatest productive economic value?" Economic growth is a specific economic phenomenon -- it would certainly be possible to have a universe in which there was no economic growth possible, but this is not our universe (see point 1), and this has nothing to do with capitalism. Indeed, even in such a universe, capitalism would be the optimal manner of allocating resources -- for example, if you had a universe in which water kept disappearing and there was no way to synthesise it or find an alternative to it, humans would be doomed to extinction in that universe but the capitalist price system would still maximise human welfare during our brief existence. I find it funny that two of the most common arguments against capitalism are that it will fail because "the planet's resources are finite" and that it can't handle the coming "post-scarcity economy". These arguments are contradictory, and both false anyway, there is nothing inherent about the utilitarian economic argument in favour of capitalism that requires scarcity or infinite resources. I think too many people conflate "capitalism" with terms like "economic growth" and "industrialism". Capitalism is just an idealisation of a system where property rights are well-defined and economic agents pursue their self-interest. And it doesn't make sense (from a utilitarian perspective) to criticise economic growth either -- economic growth (with externalities, inherent costs etc. accounted for) is just the ultimate measure of increases in well-being, it's what an economic system should be chosen to maximise. You could try and make the case that capitalism leads to unsustainable economic growth, but you'd still probably be wrong. In Austria the answer to that is private ownership and regulation. Almost all of the forests in Austria are in private ownership. The owner is responsible for keeping the forest in order and making sure it is in a good condition. The philosophy behind it is, that people would look out better for what is their own in comparison to if it was community owned. And the community is more likely to impose regulation on the privately owned forests, than it would be, if the forests were in communal hands. This creates sort of an equilibrium of forces, which conserves the forests. If both the ownership and the regulation would be in state hands it would be easy to reduce the forests for short term political gains. On the other hand if the private owners were allowed to do what they want, they would also reduce the forests for short term gain. No natural law says that we are stuck on Earth indefinitely. Of all economic systems, Capitalism has shown the most potential for growth, invention, and new things. It therefore has the best chance to establish human presence elsewhere. Assuming the premise, that resources were limited, the capitalist method would be to attempt to get whatever profits there were to be had in distributing whatever goods those limited resources provided. Really, the world has always had limited resources, over time the limits of which fluctuate, it's just that humanity has usually tended to operate well within those limits. Several answers here already argue that free markets might still be for the best and keep civilization humming optimally along whatever the case, but it's also possible that for certain scarcities capitalism might be a poor fit, and at worst a fatal one. Kill auk, sell soft feathers. Fewer auks, price goes up. Any auks left? If so, go to step #1. Necessary commodity insufficient to maintain current populace. Enough of commodity yet? If not, go to step #1. Capitalism’s answer to go by what we know how wealth is being distributed rather than by their propaganda which hides how wealth is being distributed, is that most of the growth in wealth is being captured by a small segment of the population. So long as that segment stays small, you can have so called perpetual growth; when that segment actually becomes almost the whole population such a growth strategy is simply not sustainable and a switch to a sustainable economy will have to be forced. This is not an important question. It is a theoretical question about something that cannot happen. First, it is unlikely that all the resources of the planet could be used because as the available resources of the planet are exhausted the scarcity will cause massive reductions in the number of resource consumers. So large is the planet and so few would be the number of resource users that the resource users would perish before they located all the resources. Second, even if it could happen by the time it does happen, there wold surely be no identifiable economic system other than rampant chaos and nobody would be thinking about economic systems. Third, the question is not a matter of a particular economic system since the economic system neither creates nor responds to such a scenario. Barbara Branden (at the time a member of Ayn Rand's inner circle) was asked what would be done for the poor in a free society (one devoid of the compulsion that characterizes every departure from capitalism). If you want to help them, you will not be stopped. Capitalism's answer to the problem of unlimited growth in the face of limited resources is essentially the same: If you are trying to solve the problem, you will not be stopped (not by capitalists, anyway), but if your solution requires fraud or coercion, you will not be allowed to use those methods. Not the answer you're looking for? Browse other questions tagged economy capitalism sustainable-development or ask your own question. What major flaws does this particular Universal Basic Income model have, if any? Does lowering the capital gains tax encourage investment and increase economic growth? What socio-economic measurement system may become an alternative to the economic growth percentage? What are the major types of economic system?